Bangalore-based relocation service provider Pikkol has raised an undisclosed amount of funding from Indian Angel Network. Angel investor, CEO & managing trustee Bangalore Political Action Committee (BPAC) Revathy Ashok and Raj Rathi led the funding round on behalf of IAN. As part of the investment, Rathi will join the board of the company. Pikkol, run by Rednile Innovations Pvt Ltd, operates as a relocation service platform where customers can search for a tailor-made solution for their relocation needs. The startup makes use of analytics-based technological backend and logistics network for servicing the orders. 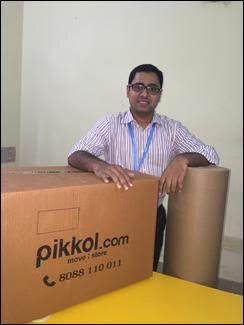 Pikkol claims to have serviced more than 10,000 moves to more than 40 destinations in India in the past one year. In addition to Bangalore, Pikkol takes care of relocations across Mumbai, Delhi NCR, Chennai, Kolkata, Pune, and Hyderabad. It has also facilitated relocation abroad to destinations such as the US, Middle East, Europe and Singapore. The company said it plans to use the funds raised in product development and expansion. “We will also be concentrating on enhancing capabilities of moving teams and continual behavioral and transactional training as part of our product enhancement,” the company said in a statement. Pikkol was launched in April 2015 by an IIM-Bangalore alumnus Deepu Chandran along with Jayaram Kasivisweswaran (IIM Lucknow alumnus), Siby Mathew (NIT Calicut alumnus), and Suraj Valimbe (an MBA from Welingkar Institute of Management) who joined the startup as co-founders. Before launching Pikkol, Chandran had co-founded Innomantra, an innovation and intellectual property consulting and services firm, in 2010. In addition to residential relocation, Pikkol also handles vehicle moves, international relocation, commercial relocation and corporate relocations across cities. The company also plans to launch specific product for corporates shortly where the HR and administrative departments can manage both employee relocations and office relocations from booking to billing with just a few clicks. “Currently, this unorganized industry is a constant source of dissatisfaction for customers. We felt that many of those problems related to accountability, reliability and transparency could be solved with technology and operational excellence,” Chandran said. The $2-3 billion packers and movers market is highly unorganized and fragmented. With increased mobility of workforce and higher urbanization, relocation market is expected to grow at 10% per annum and reach $5 billion by 2020. “In developed markets relocation market is close to 0.2%-0.3% of the total GDP,” Chandran added. A bunch of tech startups has come up in the relocation services space in the last one year. Ventures such as Moovo, BlackBuck, TruckMandi, theKarrier, The Porter, Rivigo, Grab and Blowhorn have raised funds from venture capital investors. In June, Chennai-based GoGo Truck, operated by Fruges Ventures Pvt. Ltd, raised seed funding from a Madurai-based angel investor. In April this year, courier service company DTDC Express Ltd picked up a 20% stake in logistics solutions startup Shipsy for an investment of over $1 million. Pikkol is IAN’s 24th investment this year compared with 25 in the entire last year. IAN has invested in over 55 ventures over the last two years with the portfolio spanning 17 sectors across seven countries.